A digital application to process EBT at farmers markets, saving time and helping fresh, local food be more accessible. EBT (formerly known as food stamps) is accepted at local, outdoor farmers markets by converting the electronic funds to physical wooden tokens. While the token system has its benefits, the physicality of them comes with issues—the tokens take a long time to be counted, they single out EBT users at market, and they make the reporting process time consuming. We looked at alternative ways to accept EBT in order to alleviate the issues of the wooden token system experienced by the three user groups: EBT Users, Market Managers, and Market Vendors. 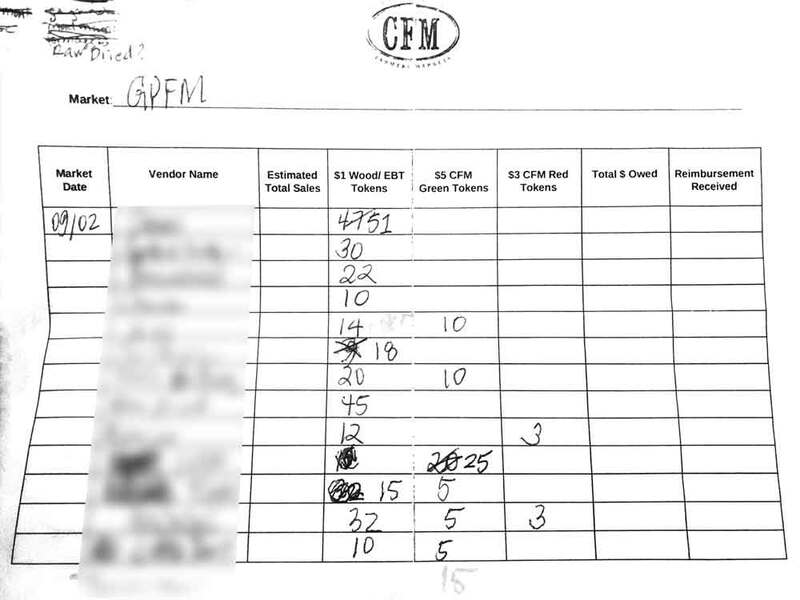 Overall, the current EBT system at Community Farmers Markets was inefficient and took up a lot of managers’ time, preventing them from doing parts of the job they really loved. An image of the physical, wooden tokens ($1 increments) that the current EBT system uses. A hand-written report of the tokens after a market. This report gets manually input into a spreadsheet for internal reporting, and then again for external grant reporting. So, the same data is transcribed three times. My team worked with Community Farmers Markets, a non-profit organization in Atlanta, to re-design their EBT (formerly known as food stamps) processing system. Because EBT is expensive to process, the farmers market exchanges EBT funds to physical wooden tokens to be used at market. While the wooden tokens have benefits, they come with a number of issues—they’re bulky, they get lost, and they take a long time to count and report. How can we approach re-designing the EBT token system to mitigate the issues it has while retaining and highlighting its strengths? Can we do it so that Market Managers are able to spend less time doing something that dislike (reporting) and more time doing something they love (helping their community grow)? By doing interviews with our stakeholders, we were able to build user-profiles and design with their needs at the forefront of our minds. It was difficult at times to juggle the needs of three very distinct user groups, but we managed to design and successfully test a digital payment system that leveraged a physical card to that met the needs of all three user groups. Aside from team activities like brainstorming, ideation, and collaborative design, I was the primary visual designer for our prototype, developed and executed interviews, and lead usability testing sessions. I was the primary contact and managed the relationship with our non-profit partner. Use appropriate technology at the right times: not everyone has the time or even wants to use tech. When designing, address this by making it as simple and easy to use as possible. Simplicity out of complexity is not easy: it takes a lot of work to distill exactly what is necessary for the user, and designing for simplicity isn’t in and of itself simple. Designs aren’t perfect—iterate often from feedback! User research is a good basis to start your design, but prototype testing and research helps validate your design and bring new changes. Because this project was intended to be used by a very specific and niche group of people, we started by conducting research a lot of background research. Desk research helped us understand EBT, SNAP, government regulations, farmers markets, and how they all intersected. We understood that the EBT system is used by three primary groups of users: EBT Customers, Market Managers, and Market Vendors. From there, we also performed a task analysis on the entire EBT processing flow at market to understand where each user interacted with it. EBT Customers – EBT Users were flexible. They could use technology or not, so we settled on three main design concepts to move forward with: Basket Wallet, QR Card, and a digital application for EBT Users. We then individually storyboarded how each EBT Customer design would impact the flow of the the user process, and we also each sketched our own features and designs for the EBT Customer ideas. Essentially, we wanted to diverge in our ideas between team members and then converge to vote on which had the best features. The following are a few of many sketches as well as one of many storyboards. Essentially, for this stage, we were working on divergent thinking to come up with quantity of ideas in order to be able to choose the best features. 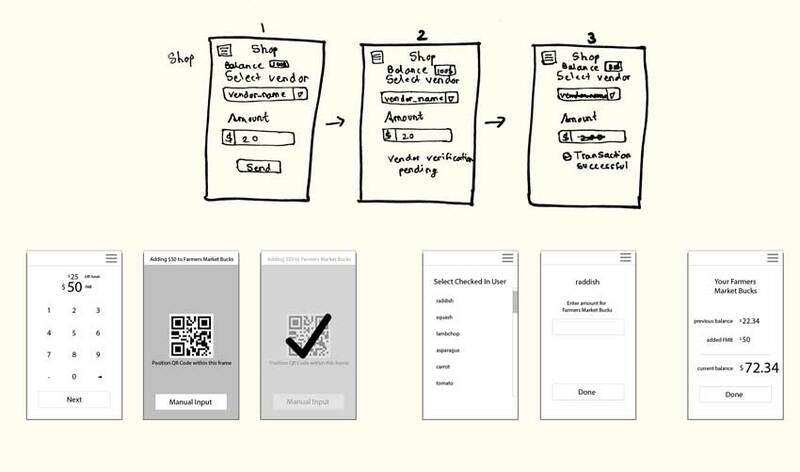 Each of us also did extremely low-fidelity wireframe sketches, and each team members’ sketches to evaluate which of had features we felt were very strong. Ultimately, we settled on a design for the EBT Customers: Market QR Card. The Market QR Card uses a QR code instead of a traditional mag-stripe, which reduces the equipment load needed from the small business vendors and farmers. It is also simple and straightforward with many real life counterparts that help users with developing a familiar mental model: loadable gift cards. So, our chosen design consisted of a QR card with an accompanying digital app for Market Managers and Vendors. EBT Users would have access to an app, too, but to keep the system accessible, it is an optional app. From there, went from our low-fi sketches to higher fidelity wireframes, and then finally, to a higher fidelity interactive prototype. In between each step, we evaluated features and design choices to ensure that we were still thinking about our users’ needs and wants—primarily, the fact that many of them wanted simplicity. Our design process went from very quick sketches of app interface and interactions, to a higher fidelity wireframe created in Illustrator. Using these wireframes that our team created, I designed the screens in Sketch and helped with creating the interactive prototypes in InVision. I also created a prototype of the physical card that EBT Users would use, so that for our next stage of evaluation, we would be able to really get the feel of our new system both digitally and physically. Below is one of our InVision prototypes. We created three: one for each user group, and since they are more or less very similar, the one I am presenting here is the Market Manager one, which was the most important and labor intensive for us. Using these InVision prototypes allowed us to test the designs with our user groups. The Market Bucks Card is designed to be similar to a regular credit card, and uses a QR Code so that vendors would not have to buy new equipment to swipe it. I built a physical prototype of the Market Bucks Card with a working QR Code so that we could get the “feel” of the card for evaluation. We worked two managers to do a think-aloud protocol different applications for the user groups. The managers are unique in that they had both been in all three-user groups at some point—they’re currently managing markets, had been EBT customers at the markets in the past, and have also been vendors at the market as well. One of the Market Managers performing a Think Aloud Protocol for Usability Feedback. Overall, the managers felt that all three applications were simple, fast, and efficient, as well as more comfortable for EBT Users to use than the wooden tokens. Displaying EBT balance to Vendors is unnecessary and violates privacy.